Greenbriar Picture Shows: Enough Of Sleuthing Couples? Too much madcap! Metro's Thin Man formula co-opted by Columbia, Joan Blondell and Melvyn Douglas as husband-wife sleuths. Blondell generally does no wrong in GPS quarters, so to find her grating as here puts salt in wound applied by too-cute dialogue and situations. Such a knowing persona as JB's, demonstrated over and again at precode Warners, is woeful miscast when harebrained, let alone as constant handicap toward solving a pair of deaths. This is once when comedy drowns out mystery to detriment of both, proof of just how delicate the Thin Man formula was, at least to extent of duplicating it. Melvyn Douglas was always a better actor than personality, sense being that he pinch-hit when a Gable or William Powell couldn't be had. Scrappy stuff between him and Blondell nears a border I'd call abuse, and what's more painful than a drunk scene that refuses to end? For Blondell's part, there'd been move away from Warner exclusivity; they'd been shunting her to B's, maybe in recognition that this daughter of the Depression had spent her bolt. Was Joan trying too hard to compensate here? There's Always A Woman is well made if not sumptuous, and there are welcome faces in the suspect line: Mary Astor, Frances Drake, Jerome Cowan ... Astor might have wondered why two-years-earlier Dodsworth hadn't done her more good. A series with the Blondell/Douglas characters was planned, one more in fact made, but with Virginia Bruce subbing for Blondell. There's Always A Woman took $505K in domestic rentals, not shabby, but nowhere near what Thin Man sequels routinely earned. Shown on TCM --- also available from Sony/Columbia DVD. This film is shown regularly on a network called "gettv". My cable company carries it and I also think it's available over the air as a digital channel -- not sure. It shows many films that I haven't seen on TCM. Or maybe I just missed it when it was shown. 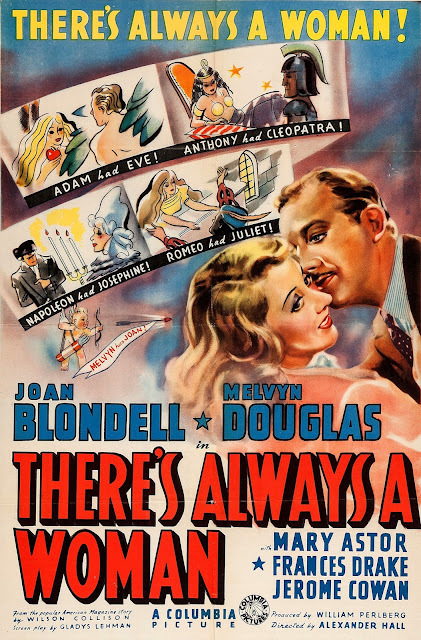 This film seems like a programmer and as much as I respect and admire Joan Blondell she is in clear decline by this point. Not really that bad a thing though, since my favorite film by her is "Nightmare Alley" made about 10 years later. On another note, is todays poster from "White Woman" (1932)? Were there many (or any) female series sleuths who didn't have steady mates? Torchy Blaine and Hildegarde Winters each had a boyfriend on the force, Miss Marple had Mr. Stringer, and even Nancy Drew had her grumbling not-quite-a-boyfriend (possibly why he grumbled).